Mabye there's a mage trainer there? Use this book to achieve higher learning. How does this book teach you higher learning? Why it teleports you into the tallest spires of Dalaran of course. And there's a typo on it: This spell only work in the City of Dalaran. Sounds like an ogre wrote it. Edit: In beta (and possibly in early live) this typo was present, but I'm keeping it here because it's funny. Ironic that the representation of a lifelong quest for becoming well read results in a tome with obvious grammar problems. But it was funny, eh? I notice that this doesn't say Bind on Pickup, is it tradeable? Or this is an oversight that will be fixed before live. Otherwise I see no reason why I couldn't do this on bank alts, and sell this in trade chat. Of possibly only trivial interest: I checked the map whilst in Archmage Vargoth's Retreat, and his chamber seems to occupy the summit of the southern tower of the Violet Citadel - the tower on the left as you face the Citadel on the front steps. It's opposite the Purple Parlor and essentially the same size, but higher up. There's a non-functional door in the chamber, but according to the map, it would open to the outside of the tower rather than into the central spire. If you look up whilst in the chamber, you can see a ring of bookshelves below a blue stained-glass skylight, so he seems to be right at the top. Edit: I did a visual survey from way back at the Violet Hold with a Spyglass, and his doorway does indeed seem to open onto a balcony. It would seem the only way he can reach his chambers is to teleport there - no wonder he says he's lonely! To leave the room, use the book again and it will teleport you back to the bottom of the Violet Citadel. This item was recently patched to BOP. You can not sell it. HAHAHA! I just Noticed! It tells ya to Read all the Books to Acheive "Higher Learning"
And then it gives you a book with Grammar Mistakes? Either purposefully done for the Sheer Irony of it, or a simple Typo they missed when adding it into the Game. It would seem the vanity pet is beyond the reach of those who completed "Higher Learning" pre-WOTLK. No book, no teleport, no pet, no nothing. What's in the room you get teleported to? Anything cool? Is it possible to get there, if a Warlock summons u, and then buy/talk to get the pet? I knew where he was and that it was the location of this book when I got to the top of Citadel from the portal within the citadel since I had Track Humanoids. When taking that portal and going out to the balcony you can mount up and fly higher, and Vargoth is not in the highest spire in Dalaran he is only in the second highest. 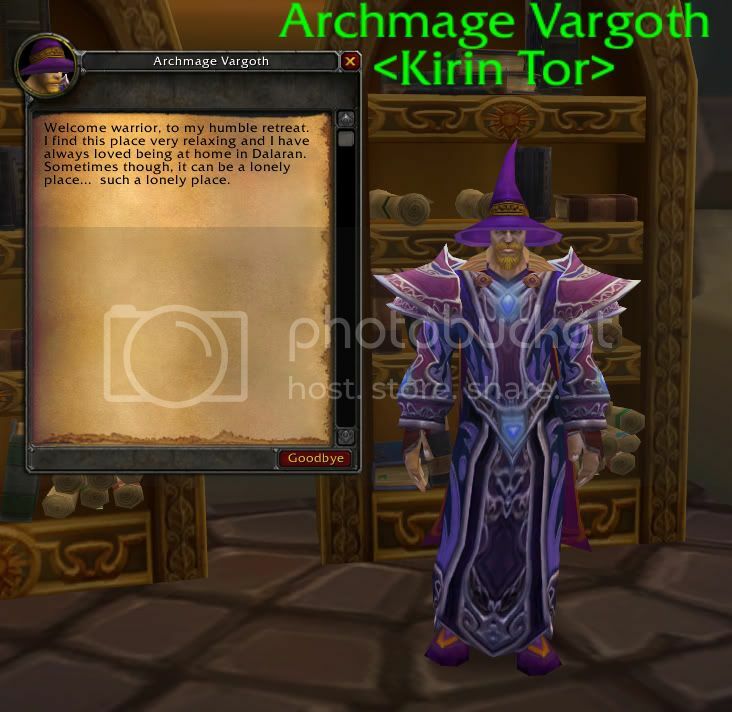 You need to complete the achievement to receive the pet, A warlock summon will bring you to the room, but you will not get the pet from talking to Archmage Vargoth. And Archmage Vargoth is exactly the same Vargoth you save at a long quest serie in Netherstorm. Since patch 3.0.8 there is a loading screen when teleporting in or out Vargoth's Retreat. Congratulations on completing your studies on The Schools of Arcane Magic. In recognition of your dedication, I'm enclosing this special volume completing the series. I believe you'll find this tome particularly entertaining. But I'll leave that for your discovery. Amazing! There are passages in here that I have never seen before. This must have taken quite a while for you to track down. If you ever find anymore books like this, I would like to be notified immediately. Please take one of my Kirin Tor Familiars with you just in case you stumble across anything. Um, it seems to me that you can just use the portal that's already in the Violet Citadel, up the stairs and to the right, to go to this room... or does it teleport you to a different room? I just got the pet and im curious if there is any other book that either the et will interact with, or will prompt you to return to the Archmage. He says, "If you ever find anymore books like this, I would like to be notified immediately." That could be just flavor, but there might be something else to look for....? You are a vending machine. Live with it. I found a way to get to the room without having the book, but it seems he won't give you the pet without it. QQ! Actually, it's grammatically correct: "this spell" is a singular subject, therefore, "works" is the properly conjugated form of "to work". "This spell only works..." is 100% correct. Just sayin'. Is there some other reason to port to the Archmage's room other than to get your Kirin Tor Familiar pet from him? Lately what I have done is create a couple of macros that I use when I don't want to be disturbed while I wait for raid or something. Macro 1 - Leave all channels, port up to Violet Citadel, ahhh, peace and serenity. Macro 2 - Reverse everything I just did, arghhhhh, chaos and trade chat. HALP! I's stuck in teh towah! After all, he has all the time in the world. Edit: During Wrath of The Lichking this little trick was the shizzle since Dalaran was the idle-hub for both factions. Since the release of Cataclysm, Dalaran is practically desserted. The Schools of Arcane Magic - Mastery is still a fun vanity item, though. Ever since I obtained The Schools of Arcane Magic - Mastery I've been teleporting to the tower whenever I want to log out for a while. Hands up who have flown to a tower in dalaran, dismounted and got stuck, unable to fly off, having to jump down and suffer 10 minutes rs. If you happen to get stuck with this in your bag, you can use it to teleport out. It teleports you here. Is the book consumed when you recieve the pet? The Questhelper addon also has the locations for the books. In your achievement window you can select whether or not you want qh to show the locations. It only keeps track of the books you haven't read yet, which can help a lot. Pffft... You guys fail. I speak PERFECT Engrish! This item can be used down in the Dalaran Sewers. It can also be used during combat, namely duels. Its cast time can also be easily fit into the duration of a Divine Shield. Sadly after the first i read - which got noted as i had readed it, the other books didn't count. They had some different names, then normal. But it's the same please where the "correct" book would be, and they did despawn after 2 - 3 mins after reading them. So maybe you ain't able to get more then 1 at the time now? I'll at least check up on it since I was sitting at waited for the server restart at 5 AM - so the books are going to respawn again. Removed earlier draft of my post below. Back when people couldn't see deleted comments, I just deleted my old one when I thought of something I wanted to change. Who knew Wowhead kept that stuff around? When you use this item and are teleported to the Archmage's study, talk to him to get a pet, Kirin Tor Familiar. That's not a typo, it's English. Actually it says: teleports the caster to and from the spires..... So your comment is wrong. if i delete this book,can i get it again? how? This book basically works as an extra hearthstone to dalaran. No matter where you are when you use the book to get atop of the spire, using the book to get back out of the room will teleport you back downstairs in Dalaran in front of the Spire. Since Dalaran has the portal to Stormwind, you can basically set your hearthstone in a less obvious place, like questing hub, fishing tournament turn in settlement. Dalaran also has the Tanaris portal but for archeology purpouses it may be handy to set a hs in the northern part of kalimdor. Or if you are a druid and have a moonglade portal, set your hs in Shat for example for quick access to Outlands. Just saying: This item makes your wow-life easier. I nominate this for the toy box. Does the book still have anything useful? Should i keep it or throw it away? 7.0 If you lost this, go to Dalaran and speak with Rhonin, he will provide it to you at no charge as long as you have the achievement. This seems broken as of 7.0, unless it's usable in new Dalaran. It says "You are in the wrong zone." when I try to use this item in old Dalaran. I do not recommend using this item in live. You will fall to your death. Usable in the Dalaran floating above Karazhan during Legion pre-launch. However, it would teleport you to the mid-air next to Violet Citadel. Have slow fall method in hand. I decided to use the item in the new Dalaran over Kharazan. All I can say is - it does not really work as it should. As of now, using this item in the Dalaran above Karazhan during the Legion pre-patch teleports you high into the air above the violet citadel. Make sure you have some fall mitigation if you use it. Otherwise it's a great way to get a boost with goblin gliders. Edit: I tried this on an alt and noticed that it didn't work before completing the Khadgar event quests. Tried again after quests, and it no longer seems to work. :( Hopefully once Dal is moved they will make this toy great again. There is no exit in the room you are teleported to, but the toy has no cooldown, so just use it again to get back. This does work in Dalaran - Broken Isles. There appears to be nothing in the room other than chairs to sit in and the doorway is shut so you cannot walk out. If you use the item again while in the room it will teleport you just outside of the Violet Citadel. This toy works in new Dalaran. It will teleport you to Archmage Vargoth's Retreat. It's an empty room, but there is one thing that is neat about it: if you are a mage, you actually go there during the class order hall campaign. During this quest, you are teleported up to the circular balcony outside of the room by another archmage and proceed by opening the door and going inside. After you complete the quest, this door remains clickable. So as long as you're a mage who has completed that part of the order hall campaign you can always use this toy to get back up, open the door, and step out onto the balcony that overlooks Dalaran. No real use besides getting up high to slowfall long distances, but it's really neat. As of Legion, you can open the door, but only as a Mage. I have tried it on my Priest and Demon Hunter but the door is not interact-able. On my Mage however, the door is. This could have something to do with the Mage Campaign quest where you have to go in here and search his room. Use: Teleports the caster to and from the spires atop the Violet Citadel. This spell only works in the City of Dalaran. "Contains the secret of higher learning."